Found a copy of the now-discontinued line of Vactec, (aka EG&G, Perkin-Elmer, Excelitas) Vactrols. Though Excelitas, the newest owner of Vactec has discontinued the Vactrol line, this catalog has an abundance of resources for those using NOS Vactrols, performing repairs or using current production optocouplers from Silonex or Coolaudio. Correct Vactrol VTL5C3 Resistance versus LED current. 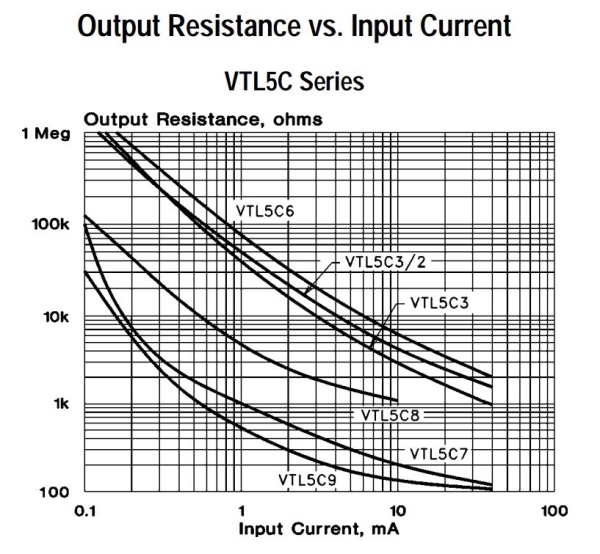 The VTL5C3 datasheet table has an error for on resistance and should not be relied upon. Chart from the Vactrol Catalog showing overlapping areas of LED emitter and CdS photocell spectral responses. I've always wondered why newer Vactrols continued to use red LEDs when the spectral peak for most CdS cells are around 550 nm (yellow). Back in the 70's-'80s when I was looking for VCA alternatives I bench tested a center-tapped LDR where I grounded the center-tap and used one half in a feedback loop to linearize control of the other half. It worked but I still ended up using VCAs. Probably for the more reliable log (dB) control law. I recall these being introduced really early when red LEDs were all that were practically available. I read on one of the guitar forums for people wanting to "roll their own" Vactrols the recommendation of using a white LED. I still think that for most cells sunlight yellow 550 nm would be the most efficient LED color. I also added a link in the OP back to the Clairex resources I posted her earlier. A 2018 update on this old thread... since this thread was started Xvive has entered the vactrol business with a line of devices that include the VTL5C1, VTL5C3 (single and dual element versions), and VTL5C4. And FYI they are using green/yellow LEDs. Thanks for joining us Mark! Interesting factoid regarding the LED color in the new models. I have some NOS VTL5C3 that would be interesting to compare to. I like the fact that the new ones aren't operating on the edge of the cells' photo-response. I would think that a Green/Yel LED would be more consistent lot-to-lot. Some years ago I played around with EL panels and found an interesting color shift versus frequency with LF being more yellow than the HF that shifted Blue. I had an app engineer for an EL panel manufacturer confirm that. I've always wondered how that affected the LA-3 signature with LF being more within the spectral response of the cells.